In five years the Shambala Festival in UK reduced their carbon footprint by 81%. Oyafestivalen in Norway created an energy program that saved more CO2 than the emissions of 13,000 cars yearly. No less than 80% of the electricity used by Ilosaarirock festival in Finland is green, meaning that the electricity is produced from water, wind or wood. 91% of all power at the Shambala Festival in UK was waste vegetable oil biodiesel. The Falls Music and Arts Festival in Australia gives festival goers an offset option when they purchase tickets. For just a few extra bucks you can offset carbon emissions created by your travel to the festival. Last year, fans offset 4,963.4 tonnes of CO2, investing in the Tasmanian Native Forest Protection Project via Climate Friendly. That’s the equivalent of taking 1,323 cars off the road for a whole year! Over 3,000 phones at Shambala Festival in the UK were charged using either pedal or solar power. Fewer and smaller highly efficient generators reduced fuel consumption at the Cambridge Folk Festival in the UK by 1/3 in the last five years. Over the past 21 recorded years, Hillside has saved 593 tonnes in CO2, which is an average of 28 tonnes per festival. In 2008 Boom collected and re-used 45,000 litres of waste vegetable oil for the generators. This avoided the emission of 117,000 kg of CO2 into the atmosphere. A solar trailer is used to power the late night stage in the camping area. Coachella has something called the Energy Playground/Factory. 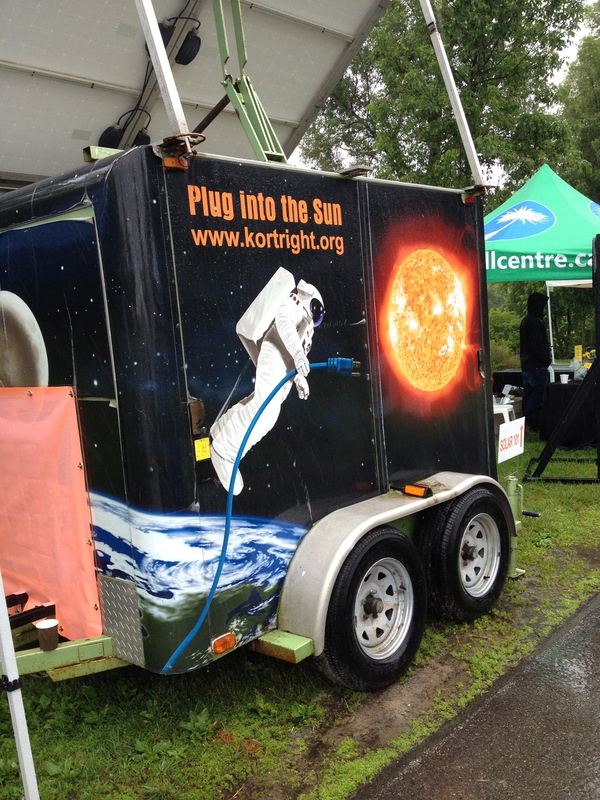 Festival attendees can learn about the latest advances in energy and ways to lower their footprint. Exhibits include bike charging cell phone stations, organic screen printing, solar powered mannequins, biodiesel workshops, and more. Includes the energy factory dj mixer – the human powered dj stage. It allows anyone to play, so long as they recruit 35 friends or fans to power their sets. Bikes, hand cranks, swings, seesaws, and human sized energy wheels provide the energy. Boom Festival’s vehicles (one truck, two vans) run on waste vegetable oil, and Boom also has one 100kw generator that runs on waste vegetable oil. Hillside showcases solar technology by presenting spoken word and acoustic performances on a solar-powered stage. Electricity consumption is monitored and calculated very carefully during the festival. Before the festival, each contributor, including sound and lighting suppliers, partners, and sales point keepers, need to provide exact calculations of how much their equipment consumes electricity. When circumstances allow, compromises are made in order to save electricity. Those sales point keepers who consume little energy can be granted an electricity benefit, which means a reduction in the rent they pay to Ilosaarirock Festival. The festival aims to encourage energy efficiency whenever possible. LED lighting is used, all generators on-site are run off of bio-diesel, and other ‘green’ electricity is purchased from a wind farm. 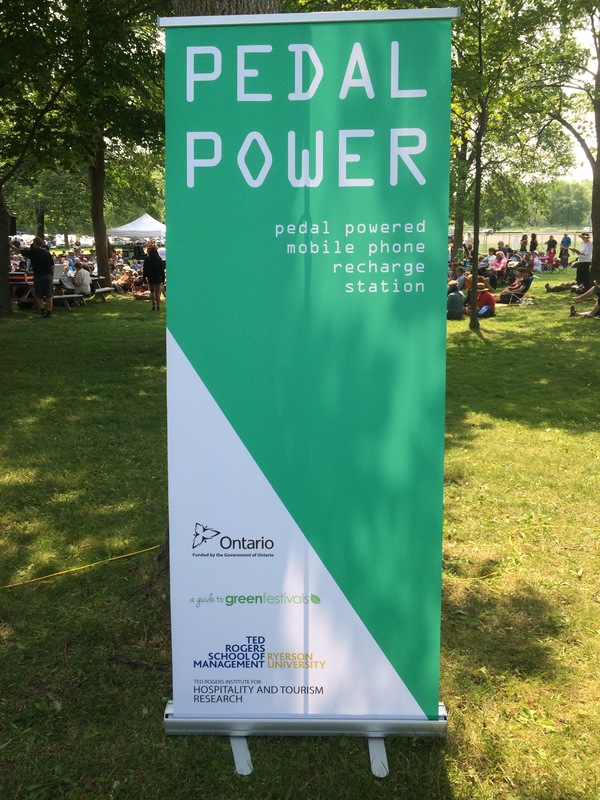 In 2015 a peddle power station was set up to allow visitors to use their own energy by peddling a stationary bike to charge their cellphones. On site electricians are asked o use LED and low energy light bulbs on stage and around the site and turn off lighting during the day, where it is safe to do so. The festival has switched where possible from large tower lights to energy efficient festoons around the site. Photocell sensors for efficiency ensuring lights are on when needed. The festival monitors their onsite energy consumption throughout the festival to always look at ways to reduce it.